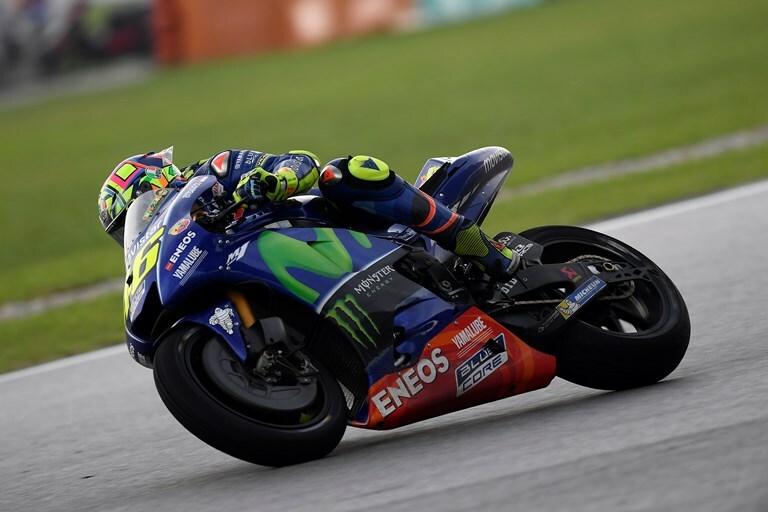 All eyes were on the skies at the Sepang International Circuit today as Movistar Yamaha MotoGP’s Valentino Rossi and Maverick Viñales lined up their bikes on the grid minutes before the start of a drama-filled Malaysian Motorcycle Grand Prix. After a dry warm up session, the wet conditions for the race made tyre choice crucial. The teammates pushed hard in the wet, whilst being careful not to get caught out by the slippery conditions. They secured seventh and ninth place respectively. He reached eighth place on lap 6. Trying to stay in contention for a good result, he was pushing to close the gap to seventh, but his attention was demanded elsewhere as Danilo Petrucci overtook him three laps later. The nine-time World Champion didn’t give up the fight and used his compatriot as a tow towards Pol Espargaró in seventh place. Viñales had a good start from fifth place, but with the conditions having changed so drastically from those in the warm up, he didn’t risk going hell for leather on the first lap. Rather, the youngster waited for the tyres to warm up and come to him. He fell back to 16th place in the first three laps of the race, before he was able to up his pace noticeably. Encouraged by the progress, the Yamaha rider spurred on his YZR-M1. At this point he was riding consistently in the 2’15s and began to make further strides. He picked up various places, ultimately taking over ninth position, two laps before the end of the race, which he held over the finish line, 38.053s from the front. Rossi’s nine-point score increases his total to 197 points, as he holds fourth in the championship standings, 29 points behind Viñales in third place. Yamaha have dropped to third in the Constructor rankings with a 31-point margin. The Movistar Yamaha MotoGP Team are still second in the Team classification, 44 points from the top. After three full-on consecutive MotoGP weekends, the team members look forward to returning to Europe to enjoy a short rest before the Gran Premio Motul de la Comunitat Valenciana, the final race of the 2017 season, in two weeks’ time.